When Tam first came into his foster home, he was scared and hid under the kitchen table. After about two days, Tam felt confident enough to come out and join the rest of the pack. Things have been looking up for him ever since! Tam is a sweet senior who quickly adapted to the comforts of a home with a clean place to sleep, plenty of food and water and lots of love. He is currently sharing his space with a young terrier puppy sister and is doing just fine. He is very healthy for a dog his age and is good with other dogs, cats and children. 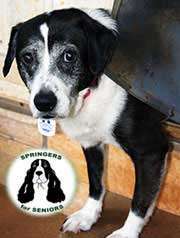 He is an extremely sweet boy that deserves a good retirement home and a family to call his own. His foster mom says that Tam is "no trouble at all." Like many of us who are aging, he does have some mild joint pain but it doesn't slow him down. 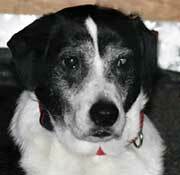 Tam would love to have a Forever Family who will give him the love he missed in much of his life. He promises to be a sweet and gentle companion in exchange for a soft place to sleep, a scratch on the head and lots of treats! Tam is healthy, fully vetted and ready to go home.